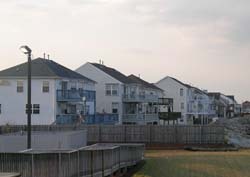 The placid uncluttered harbor of Hampton, Virginia is a haven for boaters as well as visitors and locals who saunter beside its shores, chatting amicably or just absorbing the calm. This is one of the most harmonious settings on the eastern seaboard of the United States. The natural aesthetics and the carefully considered urban design of the city which blends so well with its port, create a sense of well-being and contentment. But the lull that you feel in Hampton has not come easily; it has been achieved as the result of over two centuries of intense labor, a nation's growing pains, and commitment to ideals. And such ideals are realized only through the generous and common effort of generations of citizens. And this is why Hampton, Virginia is the quintessential people-friendly place. This too is why it is a prototype of a true pedestrian-friendly community that has preserved a human scale in its growth. Listen to the Talking Travel hour-long special on Hampton Virginia by clicking on this link. Please note. This report contains brief video clips. With a high speed connection they can take up to a minute to load. Patience is a virtue. 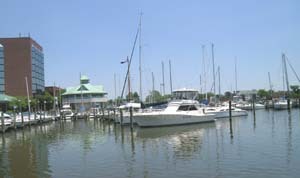 Click here to see Talking Travel's Hampton recommendations. You are never too old to ride the carousel. For more information on Hampton's historic carousel click here. If you were to float over Hampton and area in a hot air balloon, you would have no difficulty recognizing why this city is an important hub and focal point for Virginia, especially Coastal Virginia. Or even a quick glimpse of the area via Mapquest, reveals the city's strategic position. 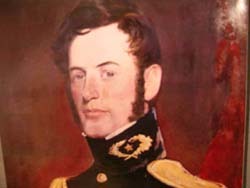 But even though over the centuries the “strategy” in question often involved military matters and military maneuvers, the real strategy of those who came to the Hampton area (and who still do) was to find a qualitatively better life. And the route to that better life was by sea. When one thinks historically of “the colonies” in the New World, one thinks “Virginia.” And because of its location, the city of Hampton continues to be the gatekeeper to this new world. 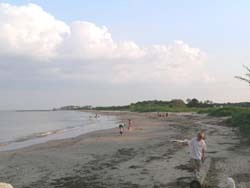 Hampton is an unparalleled seaside destination in terms of the activities available to visitors but it is also a crossroads of many waterways. The city is situated on the largest estuary in the U.S. — Chesapeake Bay. The Bay is the flooded valley of the Susquehanna, a geological phenomenon created over 35 million years ago when a fiery and exploding meteor crashed into this part of the planet leaving an immense crater. This was perhaps the first great clash of forces that Hampton and area experienced. There would be more. Tucked away in its own protected harbor on this great body of water and the Atlantic Ocean, Hampton is also a favorite stop on the intracoastal waterway; a low-key leisure and commercial working harbor, it has none of the frenetic marine activity of other port cities. And whoever is responsible for the urban development of Hampton, has created a civic ambiance that reflects this tranquil but purposeful harbor. 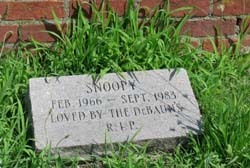 When you visit the city of Hampton, you will gradually become aware that exceptional figures — most of them well-known to you or others you have a distinct feeling you should know more about — played out their decisive and society-altering roles in the area. As you tour the immaculately maintained historic sites, these figures will drift into your awareness like benign ghosts reminding you that you are reliving the history of this nation. You are on the spot where “it” actually happened. The sense of immediacy of the events and the realization of the tangible evidence at hand initially sneak up on you, but you soon become fully aware that this is a key area in the nation where an impact of a non-geological sort continues to be felt. Booker T. Washington, Robert E. Lee, Edgar Allan Poe, Abraham Lincoln, Jefferson Davis and Dr. John J. Craven, Thomas Wolfe, Chief Black Hawk, James Monroe, General Simon Bernard (hint: aide to Napoleon Bonaparte), Ulysses S. Grant, Captain John Smith (and of course Pocahontas), General William Jackson Palmer (there's a Colorado Springs connection here),General Benjamin F. Butler, hotelier Harrison Phoebus, Harriet Tubman, Mary Peake, the Kecoughtan, Edward Teach (“Blackbeard”), Samuel Langley, Jacques Cousteau, Scott Carpenter, Gordon Cooper, John Glenn, Gus Grissom, Walter Schirra, Alan Shephard, “Deke” Slaton. We begin our visit at the Hampton History Museum, the kind of tidy, well-designed museum that, in this writer's opinion, has a traveler-friendly sense of flow, does not overwhelm the visitor, but instead presents the history of the area using what I call the CUE Factor (Coherence, Unity, and Emphasis). 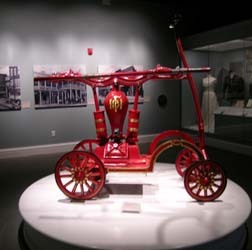 This may be, in part, as a result of the involvement in the museum over the years by local citizens who seem to have recognized that history is best learned experientially. 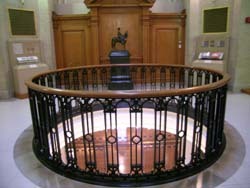 The nine permanent galleries are presented in chronological order and quickly engage the visitor. The artifacts create a real sense of identification and as the galleries lead you through time, the pieces of the puzzle fall easily into place. You begin to realize what Hampton and area are really all about. History is a process that underscores the universal principle of the interconnectedness of all things. For the next part of our hands-on history lesson, we take to the water in the company of Herb Myers a local historian and guide who has a wealth of knowledge and appreciation of the significance of Hampton and area. And our captain is Jim Baugh star of the locally-produced television show Jim Baugh Outdoors. 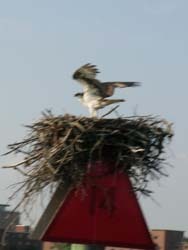 In his state-of-the-art (somewhat of an understatement) fishing boat , Jim takes us out into the Bay where dolphins play, ospreys nest on a lone channel marker, and the view of the harbor is sublime. Soon we land at Fort Wool, one of the two main fortresses that have protected the entrance to Hampton Harbor and helped secure the crucial coastal defenses of the Atlantic. 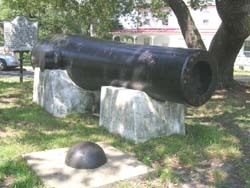 The Fort has seen duty as a coastal artillery post during the Civil War, the Spanish-American War, and both World Wars. Today, visits to the fort are organized under the regulations of Homeland Security. 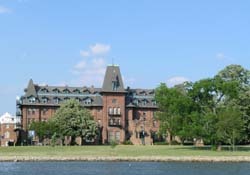 From the ruins of the fort we look across at its counterpart Fort Monroe, the latter the largest stone fort ever built in the U.S. and today, still fully operational, it is the headquarters of the U.S. Army and Training Doctrine Command. 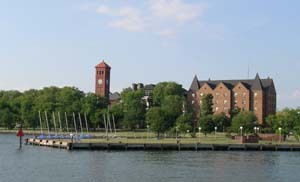 During the Civil War, Fort Monroe was a Union-held power base in the center of a Confederate state. 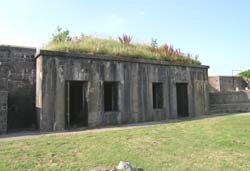 Today, the Casement Museum in the fort is a tangible part of the military history of the area. For example, you can see the small cell in which Jefferson Davis was held for two years. The lesson was obvious; this critical area of the eastern seaboard had to be secured once and for all especially since this was a perfect anchorage for the American navy. So the powers that be turned to a well-known Frenchman, Simon Bernard (lately in the employ of one Napoléon Bonaparte) who was commissioned to build a system of coastal defenses. And with the building of Fort Wool and Fort Monroe, no sane enemy captain would ever again try to penetrate the entrance and risk a crossfire. Explaining in detail the implications and ramifications of protecting this gateway, Herb also talks to us about the whole area, commonly referred to as Hampton Roads, a term used since the area was a struggling British colony. 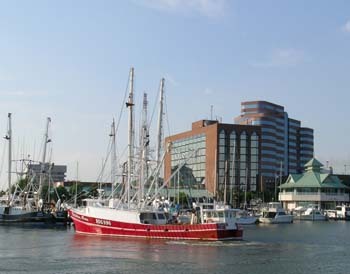 The name refers to both land and water (one of the best natural harbors in the world) describing the general geographic region in which Hampton is located. The term originates from the word “roadstead,” a nautical term that suggests a body of water where ships can find safe moorings. 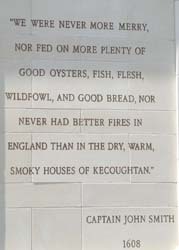 And this notion and metaphor brings us back even further in time to Jamestown. For all intents and purposes, Jamestown began when Captain John Smith and company landed at Old Point Comfort opposite Fort Wool and then as our guide at Fort Monroe, Retired Colonel Richard Mackin comments later to us, “wandered around the place looking for someplace to settle.” Where of course they did settle was on an island in the nearby James River. Continuing our visit to Fort Monroe the Colonel, whose wry sense of humor can only match his sense of history, takes us on a pleasant stroll through what is still an active military base; “fortified 1609, active since 1823.” From the ramparts he shows us the corresponding view of Fort Wool and now — more pieces of the puzzle fit cleanly together — we can visualize menacing wooden warships penetrating the heart of the soon to be former British colony. 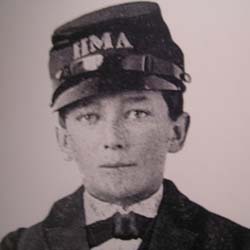 The Colonel also describes in calm but graphic detail the duel between the Confederate ironclad CSS Virginia and the Union ironclad USS Monitor as they bludgeoned each other in Hampton Roads harbor and in so doing also marked the end of the era of wooden warships. But while we give the violence and dark side of the narrative its due, we also return to the beauty of the site and again indulge ourselves in the brilliant sun, the windswept sea, and the cerulean sky. The colonel gives a brief perspective. Your mind map of the Hampton Roads area will reveal that the city of Hampton is in the geographical center of this part of Southeastern Virginia and therefore is the perfect home base for visiting this beautiful state and other highly significant historic sites and traveler-friendly cities in the region. So after exploring the treasures of Hampton, you can go a little farther afield (in most cases father afield is a half-hour drive) and visit such important sites as Colonial Williamsburg, Newport News, Portsmouth, Norfolk,Virginia Beach, and of course the Colonial National Historic Park of Jamestown. 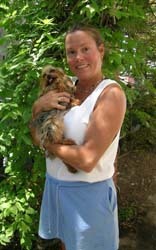 And within the Hampton area itself, you will not be short of other attractions, beaches, and activities. Historically, Hampton was the center of imports and exports to and from the new colony. And it was here that colonists from the surrounding areas came to market their wares, to buy essential goods from Europe and to receives news from their homelands. They came by horse and wagon but also via the many water routes that define the area. 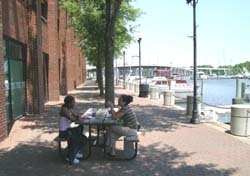 Today, downtown Hampton's renovated waterfront still has that feel of vibrant and cooperative human interchange. And it's cobblestone streets, red brick sidewalks, emphasis on integrating public and private spaces, its gardens, cafés, pubs, public art, antique stores, and other specialty shops — above all its citizens who have the time and desire to chat with you — create an atmosphere that is reminiscent of and living proof of a vision of a better life. When planning your stay, be sure to consult the Hampton Convention and Visitors website. There is much to discover in Hampton, but here are just a few favorites that impressed us during our stay in Hampton and made for a meaningful travel experience. On the campus of Hampton University, there is a large sprawling oak, 98 feet in diameter, whose branches extend upward as well as laterally as if offering refuge. It is known as the Emancipation Oak and is designated one of the 10 Great Trees of the World by the National Geographic Society. In addition to being a national Historic Landmark, the Emancipation Oak is one of the many highly poignant historic spots in Hampton. In 1863, Virginia Peninsula's black community gathered under this tree to hear the first Southern reading of President Lincoln's Emancipation Proclamation. The Act of course served many purposes but in particular it greatly accelerated the demand for African-American education. Later Mary Peake, daughter of a freed slave and a Frenchman, would conduct the first classes for newly freed men and women in the peaceful shade of the oak. This is one of the most beautiful university campuses in the country and it has a very special history and heritage. This historically black university was founded in 1868 and chartered 1870 by Samuel C. Armstrong. 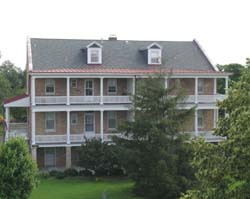 It began as the Hampton Normal and Agricultural Institute, became the Hampton Institute in 1930 and gained university status in 1984. Today it is recognized as among the top10 universities in the United States. As an educational institution that emphasizes cultural diversity it is both a role model and an inspiration not only for African Americans but for all people who strive for social justice and equality. 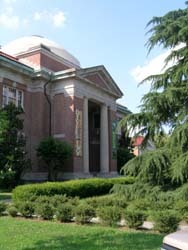 The Hampton University Museum is the jewel in the crown of this amazing institution. 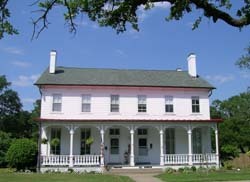 Founded in 1868 it is the oldest African-American museum in the United States. Its rare and eclectic collection of 9000 objects and artwork emphasizing the culture and artistic vision of indigenous people from Africa, the U.S., Asia, and the Pacific Islands is unique in the world. 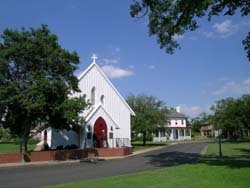 Established in 1610, this exquisite piece of colonial architecture is the oldest continuous English-speaking (Anglican) parish in the U.S. Be sure to see the stained glass window depicting the baptism of Pocahontas. Ironically, but not surprisingly given the religious purpose of this early medium, Pocahontas does not look very Native American. Visit the church's website by clicking here. 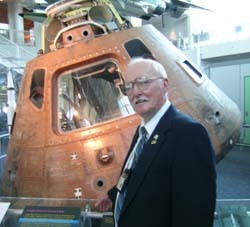 Hampton is also very much connected to later generations of pioneers in the aviation and space fields. As the original NASA training center and with Langley Airforce Base nearby, the connection to exploring other non-terrestrial frontiers is very strong. 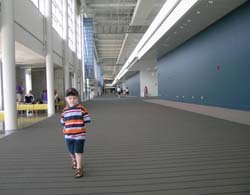 The Virginia Air & Space Center is a state of the art interactive facility that also emphasizes experiential learning. It's also a great place to play. Roy and Bob's excellent adventure. Hampton is one of those destinations where the visitor should strive to anticipate everything but be surprised by nothing. If, for example, your are an aficionado of stained glass, in the military chapel on the grounds of Fort Monroe you will be delighted to find several windows done by a certain well-known firm called Tiffany. This recently opened and very state-of-the-art facility is noteworthy for its architecture and is indicative of Hampton as a convention and trade destination. Travel journalists quickly learn that if they really want to find out what a destination is all about, they talk to someone who lives there. Because Hampton is such a people-friendly community, you will not lack for “locals” who will be more than willing to tell you about their city. Jim Baugh says it all. Hampton, VA-The Hampton Jazz Festival, one of the most well known and celebrated jazz festivals in the United States, has recently been named as a 2007 “Top 100 Event” by the American Bus Association. The awards program, now celebrating its 25th year, was launched in 1982 as an outlet to assist motorcoach tour operators in planning their yearly group itineraries. Every September, a Top 100 Events booklet is published and distributed with Destinations, the official bi-monthly publication of the American Bus Association. The booklet is also available via the web at www.buses.org. 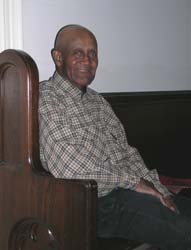 The Hampton Jazz Festival began in 1967 at Armstrong Stadium on the campus of Hampton University. The event made the Hampton Coliseum its home in 1970. Each year, the Hampton Jazz Festival attracts the top jazz, pop, R&B, and blues performers in the nation. The festival turns 40 in June 2007. 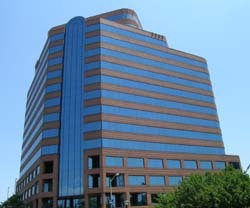 Partially bordered by the Hampton Roads harbor and Chesapeake Bay, Hampton, with the new 344,000 sq. 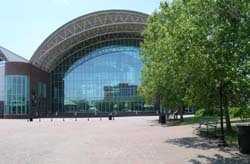 ft. Hampton Roads Convention Center, is located in the center of the Hampton Roads metropolitan area. 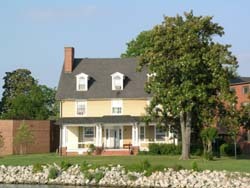 Hampton is the site of America's first continuous English-speaking settlement and is home to such visitor attractions as the Virginia Air & Space Center and Riverside IMAX ® Theater, the Cousteau Society, Hampton History Museum, harbor tours and cruises, Hampton University Museum, Fort Monroe, award-winning Hampton Coliseum, The American Theatre, among others. 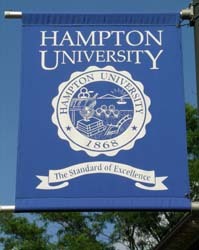 Hampton was twice-named All-America City, the nation's oldest and most prominent community recognition award.